OXFORD, Miss. – The University of Mississippi has been approved to start a Doctor of Philosophy program in the Department of Nutrition and Hospitality Management that will offer concentrations in general nutrition, nutrition policy, sport nutrition and hospitality management. Housed within the School of Applied Sciences, NHM has more than 500 students pursuing both undergraduate and graduate degrees in nutrition and hospitality management-related programs. The new doctoral program is a welcome addition, said David H. Holben, professor and chair of NHM. The hospitality industry is the fourth-largest private sector employer in the state, according to data compiled by the Mississippi Tourism Association. Meanwhile, dietitians and nutritionists held more than 67,000 jobs in 2012, according to the U.S. Department of Labor. For the NHM doctorate, students will complete 66 post-baccalaureate credit hours, including core requirements, program emphasis courses and 18 dissertation hours. The program will emphasize the science of nutrition and its application within academic, clinical and community settings. The program strengthens the overall academic environment on the Ole Miss campus, said John Z. Kiss, dean of the UM Graduate School. The NHM department already sponsors the UM Nutrition Clinic which provides nutrition services for students, faculty, staff and the Oxford-Lafayette County community; Lenoir Dining, an educational food lab and restaurant where students gain experience in hospitality management; and the Center of Health and Sport Performance, which educates student-athletes on the importance of nutrition and diet. The program is yet another stride taken to fulfill the school’s “scholar model” said Velmer Burton, dean of the School of Applied Sciences. “The research and knowledge created and disseminated by the program’s faculty and graduate students will work to improve the lives and conditions of Mississippians and their communities,” Burton said. For admission into the program, send official transcripts, coursework and a Graduate Record Exam score to the Graduate School. 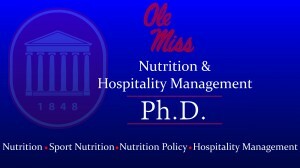 For more information, visit https://nhm.olemiss.edu/ph-d-program-3/ph-d-in-nutrition-and-hospitality-management.